We are told it is all about making better choices. If we all took more personal responsibility we could stop this obesity and diabetes epidemic, we can stop being fat. We have also been told to follow low fat diets, count our calorie intake and have more willpower. These mantras are all there to place accountability solely on consumers, a smokescreen removing our attention from the responsibility of food producers, retailers and governments. Diet drinks are not good substitutes for sugar-sweetened drinks. Studies are showing that they increase cravings, weight gain, and Type 2 diabetes. And they are addictive. A 14-year study of 66,118 women, published in the American Journal of Clinical Nutrition, discovered some frightening facts that diet sodas raised the risk of diabetes more than sugar-sweetened sodas. Here are the facts of the study that should make us all stop drinking diet drinks and products. You might say that people who are overweight and just about to get diabetes drink more diet soda, but they scientifically controlled for body weight. And they found the artificial sweeteners increased diabetes independent of body weight. Artificial sweeteners are hundreds to thousands of times sweeter than regular sugar activating our genetically programmed preference for sweet taste more than any other substance. In animal studies, the rats that consumed artificial sweeteners ate more, their metabolism slowed, and they put on 14 percent more body fat in just two weeks – EVEN eating less calories. Although diet soda might not contain sugar, it does contain sodium, phosphate, and usually caffeine (unless you make sure to get caffeine-free). Phosphate in high doses can have a negative effect on the health of your bones. Sodium and caffeine can cause dehydration, making you more thirsty, making you drink more diet soda, causing more dehydration. The Food Industry still largely maintains that aspartame is safe for human consumption. As of 1995 more than 7% of the aspartame toxicity reactions reports sent to the U.S. Food and Drug Administration (FDA) involve seizures and convulsions (DHHS 1995). The FDA stopped accepting aspartame toxicity reaction reports in 1995 (Food 1995). In a study looking at 551 aspartame reactors, Roberts (1988) found that grand mal, petit mal, and absence seizures occurred in 18% of the cases. In 1986, Food and Chemical News reported that 80 cases of aspartame-induced seizures had been reported to Dr. Richard Wurtman at M.I.T. (Food 1986). Dr. Wurtman reported three cases in The Lancet (Wurtman 1985). 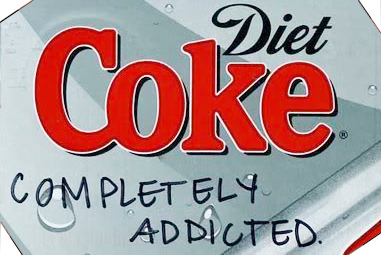 Walton (1986, 1988) published reports of nine cases of seizures linked to aspartame use. In January 1993, the American Dietetic Association (ADA) received a US$75,000 grant from the NutraSweet Company. The American Dietetic Association has stated that the NutraSweet Company writes their “Facts” sheets. Stop believing the marketing lies. If you drink diet sodas in the belief that they are a better alternative for your health and waistline then stop right now. Read labels and inform yourself on the chemicals that you are ingesting. ADA Courier, January 1993, Volume 32, Number 1.